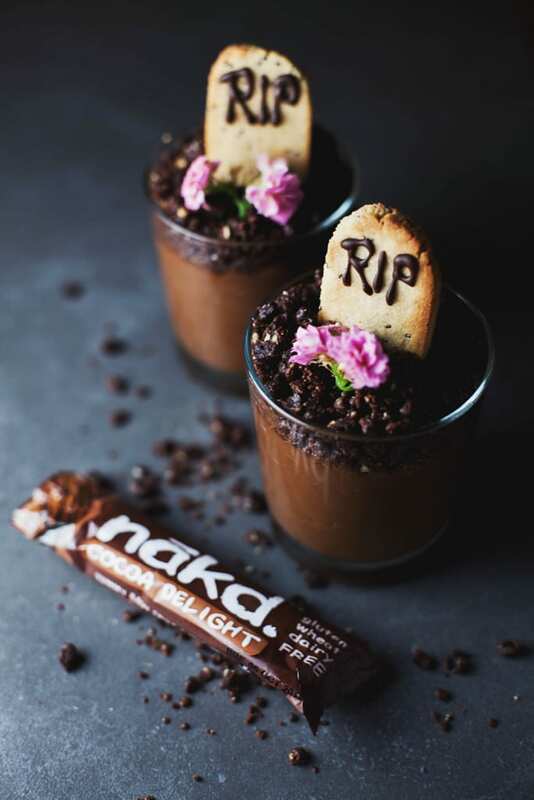 One of the recipe videos is for my Nakd Chocolate Mousse Pots and whilst making them again, an idea struck me to turn them into a Halloween dessert. 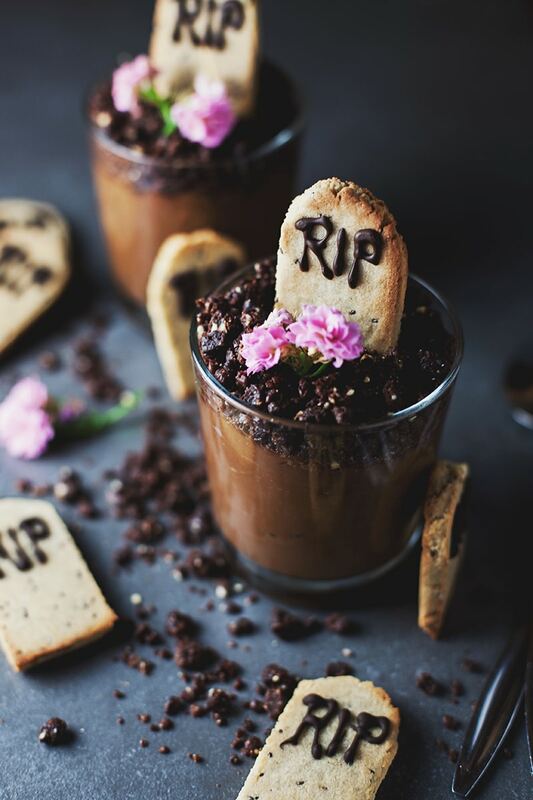 Simply by adding tombstone-shaped cookies, these mousse pots are turned into graveyard plots! Pretty morbid, I know. But delicious and a perfect treat for Halloween! Make the mousse pots according tothese instructions. You can make two large servings or four small pots. Leave in the refrigerator whilst you prepare the cookies. Preheat the oven to 180c / 350f and line a baking tray with parchment paper. In a food processor or mixer, mix together the ground almonds and arrowroot powder. Add the coconut oil in a small bit at a time so it's evenly distributed throughout the dough. Mix in the rest of the ingredients and turn the dough out onto a board. 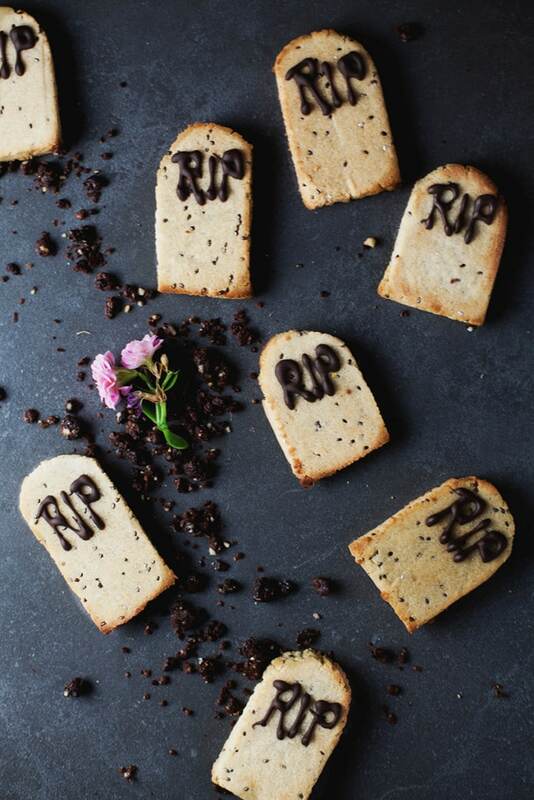 Roll the dough so it's about 1/4 inch thick and using a small sharp knife, cut out your tombstone shapes. Or , if you have tombstone cookie cutters, even better! Melt the coconut oil over a bowl of hot water. Stir in the cocoa powder, agave and vanilla extract. Leave to cool in the fridge for a few minutes. 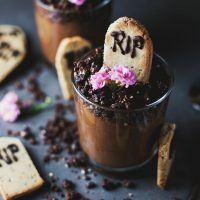 Stand the tombstone cookies on top of your mousse pots. I love this! It is so creative yet looks so delicious! I mean how could you go wrong with chocolate mousse? Beautiful pictures! They look so pretty and the recipes sounds fab! This is such an excellent idea! I love how well they fit the Halloween theme!